MRP applies the same communications skills and strengths that make its video and photographic work so effective to a wide variety of other media applications as well. Working in close collaboration with selected Web design and implementation experts, MRP's photographic, writing, and project management skills lend themselves perfectly to the development and production of Web sites requiring clearly presented information and visual richness. 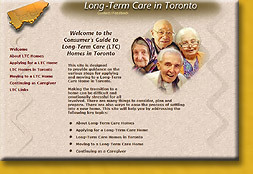 Two prime examples of such Web collaborations are this site and the Long-Term Care in Toronto site which can be accessed on the right. Besides this MRP site, another excellent example of a Web site produced, developed and photographed by MRP can be visisted by clicking on the above Web page image. Working in collaboration with selected Graphic designers and Printers, MRP can take any sort of print project from conception right through to delivery of printed materials. MRP's photographic and PhotoShop skills combine in the creation of multiple image photo montages - which are especially appropriate and powerful for posters, print material covers, or Web site Splash pages. MRP can provide "full service" project management and production, or can be comissioned to provide any one or more of a media project's individual components, such as videography, video editing, photography, copy writing, or copy editing. Many clients have found MRP's extensive media experience invaluable on a purely consultative basis, especially in the development of general communication plans or strategies. Please click to enlarge either of the two above brochure covers, both of which are examples of print materials for which MRP did the writing, photography, photo montage creation, and print coordination. 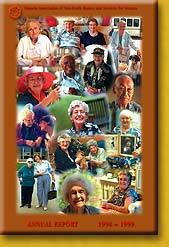 Please click to enlarge the above Annual Report cover, for which MRP did the photography and photo montage creation. and the photo montage was subsequently converted into a widely distributed poster. This site has been designed for display on Explorer and Netscape 5 or higher.